The slowing, stopping, crossing, and turning of traffic at intersections represents potential vehicle conflicts, which may result in crashes at local and rural intersections. More than 80 percent of rural intersection fatalities occur at unsignalized intersections.1,2 Furthermore, rural unsignalized intersections often have high-speed approaches, which contributes to the increased severity of any crashes that do occur. The most severe crash type at unsignalized intersections is a right-angle crash, which typically occurs when two vehicles approaching at a perpendicular angle collide due to one vehicle failing to stop or yield the right-of-way. Out of every 100 reported angle crashes at unsignalized intersections, it is estimated that between 1 to 3 fatalities and 5 to 15 serious injuries result. Therefore, it is important that local and rural road owners understand and know how to identify both the safety concern and the types of countermeasures that address unsignalized intersection crashes. Skewed angle or limited sight distance. Sequence of events and contributing circumstances. Rural intersection safety can be improved by implementing low-cost improvements that address sight distance, intersection recognition, visibility and conspicuity of traffic control devices, and roadway geometry issues. For example, adding or enhancing signs, pavement markings, delineators, channelizing islands, and flashing beacons at intersections can reduce crash risk. Sightlines should be evaluated with respect to vegetation and roadside features in order to establish adequate stopping and intersection sight distances. 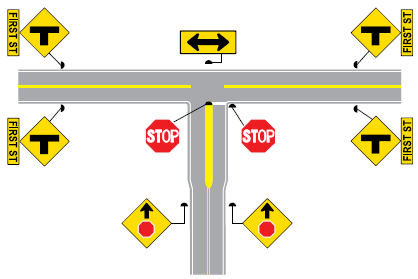 Intersections that are skewed (e.g., not perpendicular) may be modified to intersect at a more desirable angle (closer to 90 degrees) or controlled with regulatory signs or signals. The Federal Highway Administration (FHWA) encourages agencies to consider the following treatments, either on a systemic basis or at spot locations, although the systemic approach may have a greater cumulative impact on reducing fatal and serious injury crashes. The table below shows treatments for stop-controlled intersections, the associated crash modification factor (CMF),3 suggested crash thresholds in which the treatments should be applied, typical cost of implementation, and additional considerations. For example, the figure on the following page shows a basic set of sign and marking improvements that has the potential to reduce crashes by 30 percent. 3 A crash modification factor (CMF) is a measure of the safety effectiveness of a particular treatment or design element. A CMF less than 1.0 indicates that a treatment has the potential to reduce crashes, while a CMF greater than 1.0 indicates that a treatment has the potential to increase crashes. A CMF is determined by dividing the estimated number of crashes with a safety treatment by the estimated number of crashes without a safety treatment. For example, if an intersection experiences 10 crashes per year before a treatment is applied and 8 crashes per year after a treatment is applied, the CMF for the treatment is 0.8, netting a 20 percent reduction in crashes.